Talks with Labour aimed at finding a new Brexit consensus will continue next week, while Parliament is in recess, and the government hasn’t set red lines for these negotiations, Hammond said. 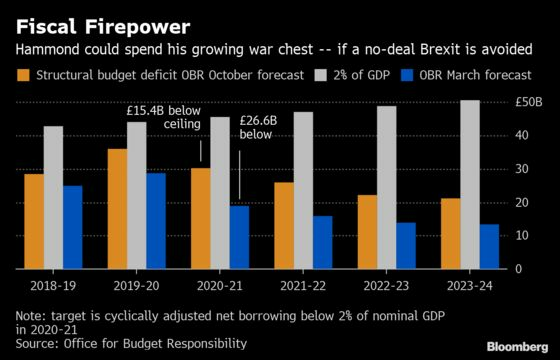 However, Hammond also warned that if the two sides can’t find a compromise, he may need to cut short a three-year spending review -- due to start in the summer -- aimed at ending austerity. “If we don’t have a deal done, the level of uncertainty that will remain probably makes it inappropriate to do a long-term spending review,” he said. Hammond has promised a boost for cash-strapped departments, but only if he can release money kept back in case of a no-deal Brexit. He’s projected to have a 26.6 billion pound ($35 billion) buffer against his fiscal mandate next year, which could be used to increase budgets for education, health care and policing -- if the U.K. leaves the EU with an agreement. The government has promised to end almost a decade of spending cuts that boosted support for the anti-austerity Labour Party, costing the ruling Conservatives their parliamentary majority at the 2017 general election. Prime Minister Theresa May was forced to open the door to Brexit negotiations with Labour leader Jeremy Corbyn after Parliament repeatedly rejected the divorce terms she negotiated with Brussels. She hinted in Parliament on Thursday that staying in a customs union was a possible compromise, as she said the two sides agreed on more than it often appeared. She has previously ruled out staying in a the EU’s customs regime as it would prevent the U.K. having its own independent trade policy. Britain was due to leave the EU on March 29, but has twice had to ask the bloc’s other 27 leaders for an extension. The latest plan, agreed this week at a summit in Brussels, is for the U.K. to depart the bloc by Oct. 31. Though he has described a second Brexit referendum as a “coherent proposition,” he said Friday he was skeptical the new date gave enough time to hold one because it would take about six months to organize. He played down reports the EU set the deadline with another plebiscite in mind. “If that had been your motive, you would have given longer than October because that looks very tight,” he said. Hammond lamented that the political uncertainty over Brexit had damaged Britain’s reputation “as a bastion of democracy.” As well as delaying business investment, he said some prospective candidates to replace Bank of England Governor Mark Carney, who is due to step down in January 2020, would be deterred by the fact Brexit hasn’t been resolved. “We’ve got a bit of work to do to recover our reputation as cool, calm and collected,” Hammond said.